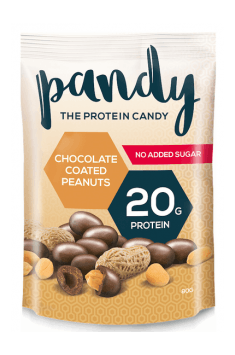 Pandy Protein Chocolate Coated Peanuts are peanuts coated with chocolate enriched with whey protein. They taste just as good as traditional chocolate-coated nuts, except they are much less caloric, provide a lot of wholesome protein and do not contain sugar. Peanuts come from a plant belonging to the family of Legumes. They belong to products with high nutritional density. They contain a lot of protein and fiber. They also provide a large amount of fats, however, these are mainly one – and polyunsaturated fatty acids, which have a number of health-promoting properties. Importantly, peanuts do not contain trans fatty acids that contribute to the development of obesity and cardiovascular diseases. Specialists emphasize that raw, unprocessed peanuts have the greatest value. They contain much more vitamins, minerals, and valuable polyphenolic compounds than in processed nuts, such as, for example, peanut butter. As already mentioned, peanuts are an excellent source of plant protein. However, this is not the only source of protein in the presented product. In addition, a whey protein concentrate was added to it. It is characterized by a high content of amino acids and is rich in branched chain amino acids (BCAA). Physically active people, who show an increased need for proteins, sometimes may find it difficult to ensure their adequate supply from the diet. However, high-protein snacks, such as the presented peanuts, come with help. The combination of peanuts and chocolate is a real treat for the palate, which is hard to resist. Unfortunately, this is most often a real caloric bomb. The presented product has much fewer calories than regular, chocolate-coated nuts. This is primarily due to the specially composed chocolate. The chocolate coating the peanut does not contain a gram of sugar and is just as tasty as the traditional one. It owes its sweet taste to sweet, healthy, and diabetic-friendly sweeteners. In conclusion, Pandy Protein Chocolate Coated Peanuts is a protein-rich snack that perfectly replaces the popular nut-flavored drops. These delicious peanuts were covered with a layer of special sugar-free chocolate and enriched with whey protein. Thanks to this, they have fewer calories than regular nuts in chocolate and are much healthier. Ideally suited to the diet of physically active people. Use according to the individual daily calorie demand. Excessive consumption may produce laxative effects. The presented product is a good alternative to regular chocolate nuts and popular drops, M & M's. It is a valuable, protein-rich snack. Due to the sweeteners used, excessive consumption may cause a laxative effect. Pandy Protein is a company that specialises in manufacturing sugar-free and low-calorie snacks. It made its successful debut in 2015, launching dietary jellies which gained immediately many loyal fans. Over time, the product offering was expanded to include protein chocolate and crispies. Pandy Protein has ambitions to create tasty, low-calorie and primarily healthy snacks which can be consumed without guilt. All products are high in protein and sugar-free. They are based on unique and tested recipies. What is more, the quality of ingredients used in production is a major priority. Chocolate (52%) (cocoa mass, sweetener: maltitol, cocoa butter, emulsifier: soy lecithin, natural vanilla flavouring), peanuts (29%), whey protein concentrate (milk) (19%), sweetener: isomalt, gum arabic, rinse aid (shellac), vegetable oil, ethanol. May contain traces of nuts, eggs, and gluten.